Arium utilized the constraints of the existing space to design a guest experience that directs attention to a transaction counter and hints of a fun time just around the corner. 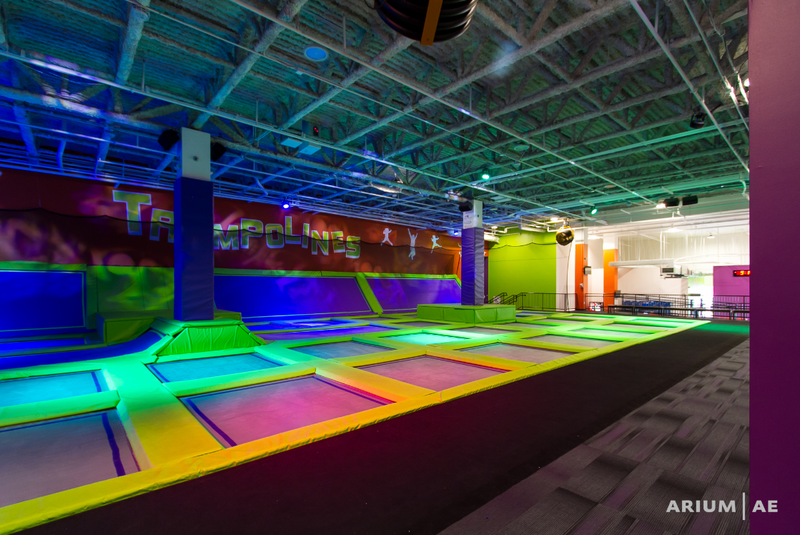 Activity centers like trampoline parks, indoor play areas, and ninja courses have exploded in popularity recently and are popping up across the country. Arium has several years of experience working with a number of companies opening these highly profitable facilities across Maryland and Virginia. Ceiling mounted fans cool down the space as guest navigate the various jumping activities. 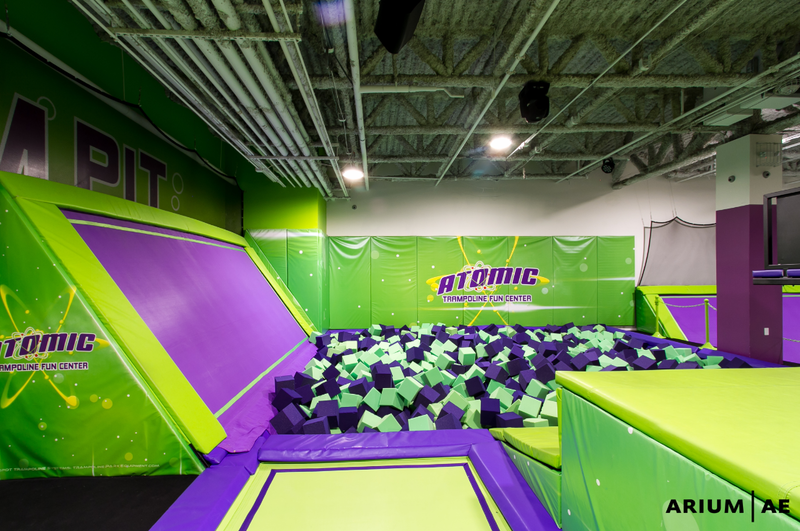 In a collaborative design-build effort with general contractor TWC Contracting, Arium was presented a cold dark shell space within a multi-use building to design the Atomic Trampoline Fun Center in Leesburg VA. A unique configuration of the approximately 16,000 SF of space, proved to be a challenge to achieve the client’s program requirements for this family entertainment facility. A giant foam pit with warped walls allow for guests to immerse themselves. 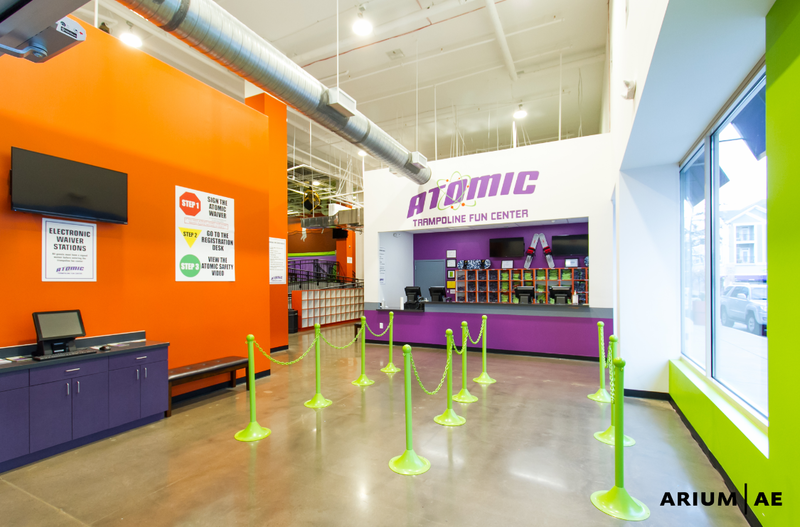 After working through a number of scenarios, Arium was able to incorporate the requested check-in counter, waiver area, offices, bathrooms, party rooms, and over 40 interconnecting trampolines, dodge ball court, foam pits, and two “slam ball” courts. A light show helps create a fun atmosphere for themed events. An exposed ceiling concept allowed for a spacious welcoming at the front entrance and plenty of room to jump on the trampoline floor. 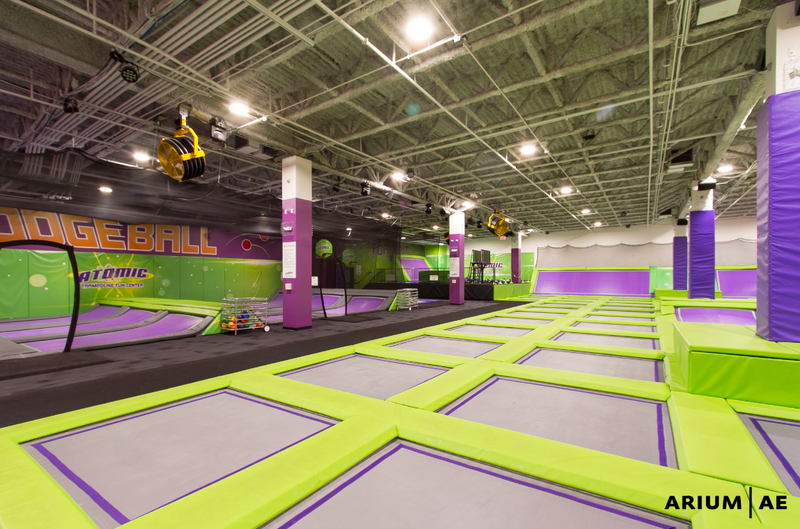 The trampoline area utilizes several large ceiling-hung fans to keep the guests cool while jumping. A night, a themed light show animates the space. Private party rooms allow for guests to reserve space within the facility for their planned events. 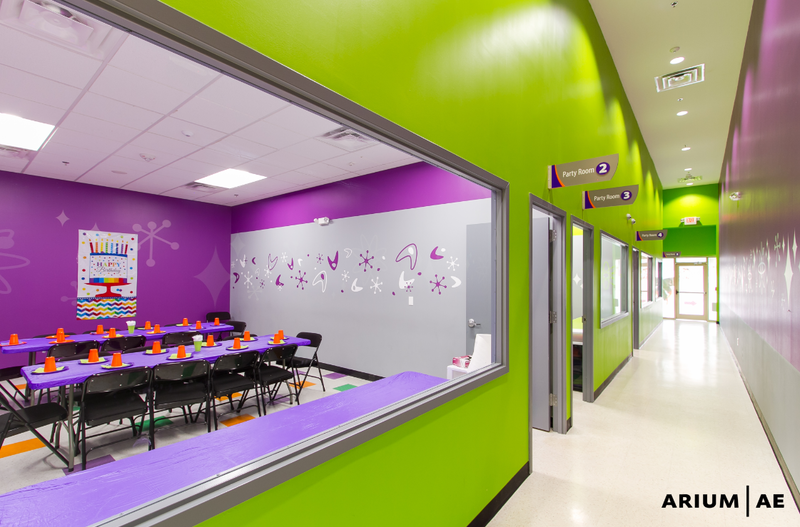 In keeping with the fun and family/teen centered environment, Arium selected vibrant paint and flooring color schemes throughout that correspond with the Atomic brand identity. The relatively new function, specific equipment requirements, and reliance on a number of atypical building materials in these types of facilities requires high levels of code and permitting coordination. Clients continue to choose Arium due to our exceptional experience with jurisdictions across the Mid-Atlantic region. Our integrated design team is capable of meeting aggressive schedules and assisting the client with the execution of projects on time and within budget.